Birds and poultry movement from five counties in Texas and New Mexico is being prohibited after laboratory tests completed late Wednesday, April 9, confirmed Exotic Newcastle Disease (END) had infected a backyard flock of chickens last week near El Paso. As a preemptive measure, state and federal animal health regulatory officials earlier this week destroyed the flock, but are concerned that END, a highly contagious foreign-origin virus, may have spread to other poultry and birds in the area. El Paso County has been quarantined by the Texas Animal Health Commission (TAHC), and the New Mexico Livestock Board has quarantined Luna, Dona Ana and Otero Counties in New Mexico. By mid-afternoon Thursday, April 10, the U.S. Department of Agriculture (USDA) is expected to place a federal quarantine on these counties, in addition to Hudspeth County in Texas. "As of Wednesday evening, infection has been confirmed only in El Paso County," explained Dr. Bob Hillman, Texas state veterinarian and executive director for the TAHC. 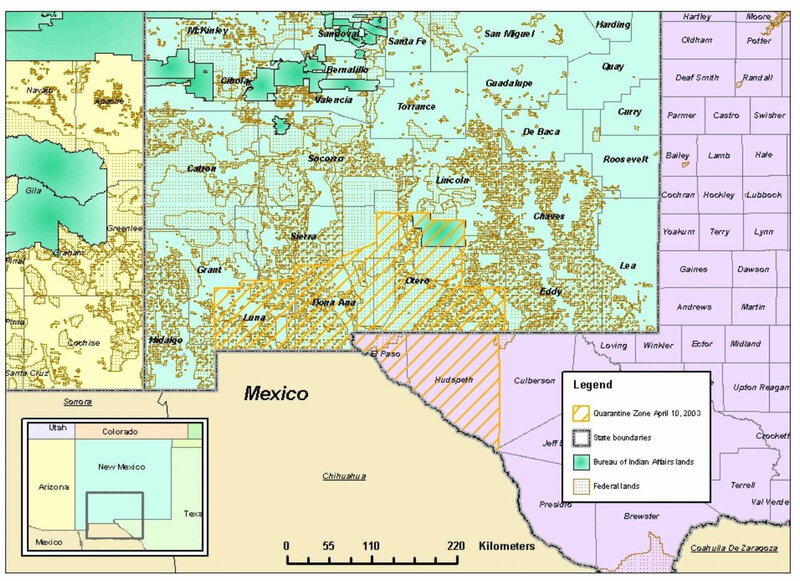 "However, the five counties quarantined in Texas and New Mexico are considered to be a trade area in which there is significant movement of birds and poultry. State and federal authority is being imposed so that disease surveillance, testing and diagnosis can be conducted. It is customary for the USDA to quarantine additional counties, in order to create a 'buffer zone' around an infected county. The END outbreak must be stopped before it spreads to other backyard, hobbyist or exhibition flocks, or to the commercial poultry industry." Dr. Hillman explained that the USDA is providing fair market payment for birds that must be destroyed during this disease outbreak. He stressed that END does not affect human health, nor does it affect poultry products or eggs. "We are depending on bird and poultry owners to assist us in eradicating this disease outbreak," said Dr. Steven England, state veterinarian for the New Mexico Livestock Board. "Please report illness or unexpected death losses to your private veterinary practitioner or to the TAHC or New Mexico Livestock Board." The TAHC has a 24-hour hotline that can be reached at 1-800-550-8242, and the New Mexico Livestock Board can be called at (505) 841-6161. END usually has a two to 15-day incubation period, and infected birds or poultry may exhibit signs of respiratory distress, including gasping or coughing. The virus also affects the central nervous system, causing infected birds to become paralyzed, develop muscle tremors or twist their necks. In some flocks, disease may strike quickly, and the only sign is death loss. "We are asking for full cooperation from bird and poultry owners. Do not move birds from the quarantine area. Do not move birds within the area, either," he said. "If at all possible, keep birds in isolation on your premise, and ensure that no birds are introduced onto your property during the quarantine period." Dr. Hillman said that the quarantines will last until state and federal animal health officials are certain all disease has been eradicated and that it is safe to resume normal movement and activities. "Take precautions," said Dr. Hillman. "Clean your boots prior to entering bird pens. You could pick up contaminated manure on your footwear at the feed store, at the coffee shop, or at your neighbor's place. Use bleach and water or a commercial disinfectant to spray or dip your boots. Wear clean clothes when working with the birds. Clothing, too, can pick up viruses that can be transmitted to your birds." "We can stop the spread of this disease, but only if we all work together quickly and cooperatively. Report illness in your birds. Abide by the quarantines. Practice good biosecurity," said Dr. England. "By addressing this problem together, we can stop this disease before it has a chance to become widespread in Texas or New Mexico."